Whether you are an accounting geek, a systems person or just want a deeper understanding of accounts payable we are about to get into the nitty gritty of AP. In a full service management company I was a partner of and President I implemented a powerful AP system in 2004 that provides greater tools and transparency for staff and clients. I continue to use this system in my new company, Community Financials, which only provides financial management services to the condo and HOA market. I wanted to share some of its features and let you in on some condo & HOA accounts payables process best practices. Online Board Approval – I hear from board members that they don’t know what their expenses are – being able to see the bills takes care of that. 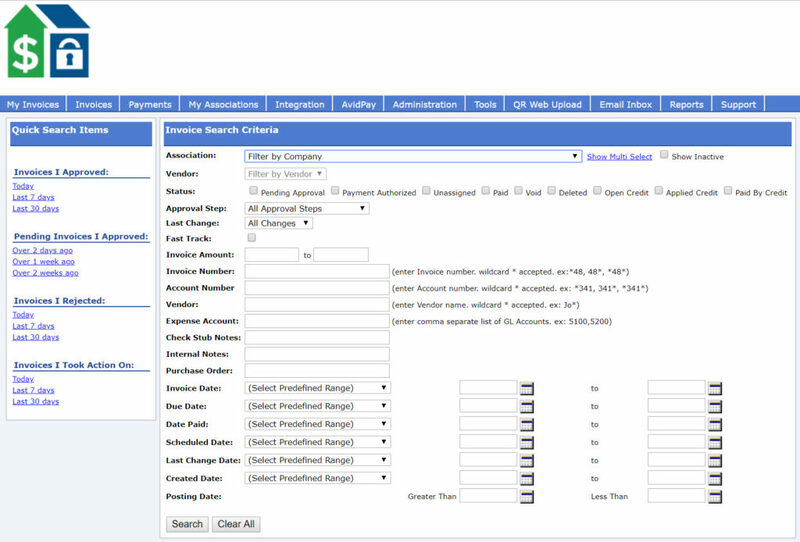 A great feature to control the association’s money is the ability for the board to review and approve bills online. Your bills get sent to a lockbox and get scanned into an online approval system. Two board members usually the Treasurer and President create a unique login. We can set up 2 board members to approve all bills or just have a 2nd board member approve bills over a certain dollar amount, this provides oversight. By approving the bill online they have digitally signed off and then the payment gets processed. One benefit of this feature is you don’t have the problem that signing physical checks had: there is no need to hold up bill payments while you wait for the President or Treasurer to come back to town. 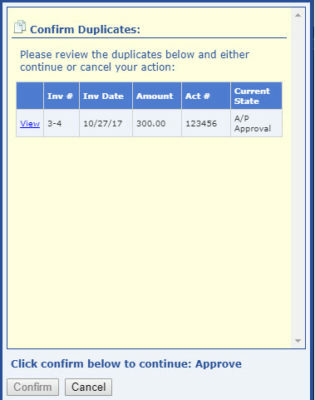 Board Member Review Only Access – Other board members that may not be in the approval process may want to view the invoices. We can set them up with view only access and include them in the transparency. Additionally, another best practice is to give your CPA/Auditor this login when they audit your financials. It will save them time and you money. 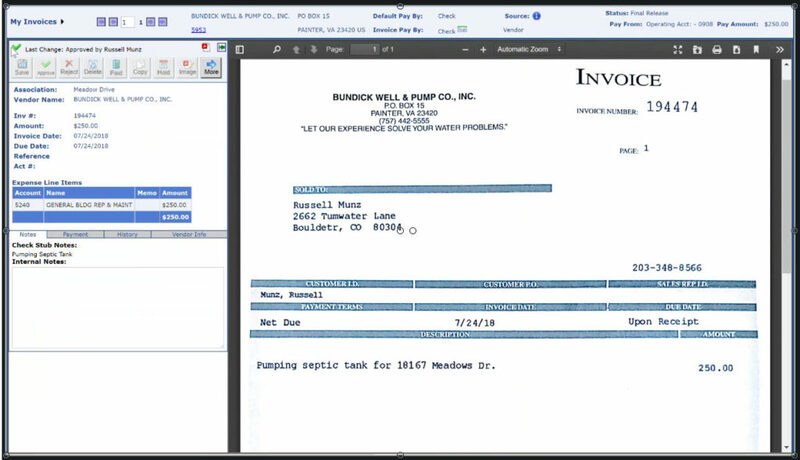 Search invoices – in addition to viewing bills there is a powerful search capability in the system. Say good bye to rifling thru file boxes and pecking at a calculator. Our system allows anyone with access to search by vendor, GL code or date range and get a report with a total of the expenses and all of the backup invoices. Flag Vendor Insurance Expirations – Ever hear of a community that was sued because a vendor got injured on the property and they did not have workman’s’ comp insurance or their insurance expired? It happens. Our system will warn of vendor insurance expiring – we can set warnings 30, 45 or 60 days out. The system shows a graphic that cautions do you want to pay since insurance is expiring/ expired? A board member in the approval process will see a warning icon and be prompted to get an updated insurance certificate from the vendor and then relay that to our staff to update the system. We can set a default GL code for a certain vendor to reduce coding errors and inaccuracies in financial reports (income & expense statement). If Bobs painting only does painting we can set it up so that every time there is a Bob’s painting for Happy Homeowners Association the GL code will default to maintenance or painting or whatever you select. This reduces manual coding errors and results in a more accurate financial report. Another great feature is we can set up GL code templates for vendors which will prompt accounting staff and approvers to split up an invoices line items into separate GL categories. An example is your landscaping vendor does lawn cutting, new plantings, services the irrigation system and does snowplowing but puts it all on one invoice. By creating a template for that vendor our system would show all of these GL codes to divide the invoice into. All parties in the approval process would see these codes and either enter or confirm the dollar amounts for each category. This improves the accuracy of your financial reports. Our system will flag duplicate invoices by association, vendor and invoice # to help prevent double paying a bill. Ever have a vendor send a proposal and also an invoice, or have a change in accounting staff which sends a duplicate bill? This will help prevent that from happening. The system works with both Caliber and Tops, the two community accounting/management softwares we use, and can upload some invoice info like invoice date, number, amount, vendor name, etc. into our accounting system which reduces data entry and can decrease the chance for data entry errors. We believe these condo & HOA accounts payables process best practices can be adopted at your community whether you are a client of ours or not. These features of Community Financials’ accounts payable process provides greater transparency and greater accuracy for our clients. If you want to learn more about the system you can watch our video on online approval or a video on invoice searching. If you want to talk further about how to upgrade your associations accounting process and get a quote for Community Association’s services schedule a quick call and we’ll provide a proposal within an hour after the call.